Ideas have spread, movements created, leaders elected, and new policies established because of the power — the impact — of storytelling. As science and our planet face new challenges, storytellers who create awareness and inspire change are needed now more than ever. At the 2019 Planet Forward Summit on April 4-5, learn from some of the best communicators, photographers, innovators, policymakers, and journalists in the world. Discover what “impact” really means for communicators and creatives alike, and network with influential people and organizations in sustainability and science. Find your voice. Be a storyteller. Help move the planet forward. Register now to reserve your spot. The app is the easiest way to connect with other Summit attendees, stay up-to-date on the Summit schedule, learn about our partners and internship opportunities, and much more. Tom Szaky has one mission — to outsmart waste. His company, TerraCycle, makes the un-recyclable, recyclable. As the planet drowns in plastic and chokes on trash, Szaky is discovering new ways to turn waste into consumer goods. Hear his story – and how he uses media to tell it and convince the world there is another way. What kind of impact do you want to have with your sustainability story? It depends how you define impact. Are you trying to inform? Engage? Persuade? Mobilize? In this conversation, storytellers from different media backgrounds share how they build community and measure success. - Kimberly West, Director of External Communications, MARS Inc.
Just about anyone with a smartphone and a social media account can tell a story. But to attract a crowd, you’ll need a great idea, a powerful narrative, and a distinctive “voice.” Planet Forward student storytellers share their experiences, challenges, and the techniques they’ve learned. Planet Forward announces sustainability internships, travel, and other special opportunities offered by our partners and consortium schools. You can learn more, meet people, and visit tables during the networking break. Perhaps no publication has been more influential in the environmental space than National Geographic. So how do they define and measure impact? And how can you be involved? Know your audience. This panel discusses how climate change and sustainability can resonate with young, engaged, digital news consumers. In this workshop, podcaster and journalist Kameel Stanley will dig into one of the coolest ways to amplify storytelling — through sound. You’ll hear how she makes We Live Here, an award-winning St. Louis-based podcast about race and class, *and* walk away with ideas and techniques to bring stories from YOUR lips to THEIR ears. Bill Douthitt, Photography Managing Editor for Science Magazine, will share a few simple concepts about making pictures. If you practice these and learn to use them, they will make a huge difference in the quality of pictures that you produce. This has nothing to do with equipment. It has everything to do with the way that you look at the world. Everything he will talk about and almost everything he'll show you is done with a camera phone. Having pictures with your story helps attract reader interest. And just as having a story with good writing is more marketable a story than one with acceptable writing, having good pictures is more marketable than acceptable pictures. Being able to produce your own good—that is to say, publishable—pictures not only helps attract attention to your story. It can make you more attractive to the editor who is deciding whether to hire you or someone else. And, it is potentially another income source. Gene Editing: Is This The Next Food Revolution? What exactly is gene editing, and what is CRISPR? We learn about the technology, and discover what kind of impact could gene editing might have for agriculture and farmers. Women are underrepresented in several areas of STEM, especially in STEM leadership. This panel will have women leaders, from different walks of life, tell their stories and share their challenges. It is hoped that this open dialogue will inspire more to be leaders. Gene editing can be a solution to many of these challenges, but too many either a.) don’t understand the technology as a result of lack of scientific understanding, b.) conflate the technology with GMOs and dismiss it, and/or c.) have questions or concerns about the technology even with the understanding that’s different from GMOs. To work around these societal roadblocks, we’ve learned that we must have a values-based conversation. Consumers care about their morning coffee and OJ, so we must educate them on the role gene editing can play in ensuring these goods will be around for a long time. That values-based conversation must be intriguing and must include several mediums to carry message. We must drive conversation to where consumers are. SymbioSEAS is a locally-based art exhibit in Honolulu, Hawaii, representing a collaborative effort between community artists and scientists at the Hawaiʻi Institute of Marine Biology over the past year. Through various artistic mediums, the exhibit strives to bring global awareness to the health & rehabilitation of our oceans and coral reef. This unique partnership has allowed us to engage our community to tell the story of coral reef ecosystems and the scientists who study them. We are excited to share our journey with you and hope to inspire you to explore your own outlets of creative communication. This session of the Planet Forward conference will focus on best practices in teaching Environmental Communication. Faculty from consortium partners will briefly present the pedagogical models they have used in their teaching, followed by a workshop style discussion of "what works" and "what does not." Participants interested in issues on Environmental Education / Communication are invited to attend. The session will be chaired by Dr. Anandam Kavoori, Professor, Grady College of Journalism and Mass Communication, University of Georgia. This session will highlight Adventure Media, a regularly-held experiential media and communications course that exposes students to their natural environment and a greater understanding of place through backcountry bikepacking and media production. Additionally, the presenters will share thoughts, considerations and recommendations on creating coursework that integrates field-based academics and environmental knowledge and application. Question: Can games be stories? Answer: As Frank would say, they've got characters, overcoming worthy obstacles, to achieve worthy outcomes. All the ingredients of great stories and more. This session will explore games as interactive narratives as well as vehicles for education, awareness raising, influencing behaviors and persuasion. We will discuss some of the science behind educational gaming, view a few different types of environmental and educational games, and discuss how to use educational games in your classroom or community to achieve environmental progress. As an author and influential climate realist, Jeff talks about the climate story and how he has influenced the climate narrative. He turns data into a powerful storytelling device to illustrate how serious the situation is. He believes storytelling can inspire the change needed to help rescue the planet. A roundtable with journalists and communicators considers how the media are changing their approach to the climate story. Is it enough? Will it make a difference? Audience Q&A throughout. Beyonce and Jay-Z’s nutritionist, Marco Borges, believes eating plants is not just good for you, it’s good for the planet. Meet the entrepreneur and storyteller behind 22 Days Nutrition. Find out why the food story is more than a fad. It’s a lifestyle that affects you - and the world. Stories need heroes. So does the planet. In this extraordinary conversation with passionate environmentalist Laura Turner Seydel, we learn about how she and her father, media mogul Ted Turner, launched Captain Planet and turned a kids' show into a catalyst for change. Laura now strives to empower a new generation of environmental heroes. The power of the picture is indisputable. But how do you turn an image into a story. Steve Winter has traveled the world and taken some of the most powerful pictures on earth. How does he turn the visual into the memorable? Sponsored By National Geographic. Storyfest finalists and the rest of us find out who wins, and who gets to go on a storytelling expedition to the Galapagos Islands with Lindblad Expeditions and Planet Forward! — Hotel Hive: A sustainability-minded boutique hotel just a couple blocks away from the Jack Morton Auditorium. Also features a delicious, locally owned pizza shop (we recommend!) and rooftop bar. — Pod DC: A sustainability-minded boutique hotel in downtown DC across from the Chinatown Metro station. — One Washington Circle: A hotel just a couple blocks away from the Jack Morton Auditorium. Located between GW's Foggy Bottom campus and the historic Georgetown neighborhood with plenty of delicious coffee shops and restaurants. — Georgetown Suites: A hotel located in the heart of the historic Georgetown neighborhood, about a 15-20 minute walk away from the Jack Morton Auditorium. If you need additional recommendations or have any questions, please contact Hannah Dale, Planet Forward Program Coordinator, at hannah@planetforward.org. To learn how you can sponsor student travel to the Summit, and explore sponsorship benefits and levels, please contact Stephanie Aboukasm, Assistant Director for Corporate Relations. 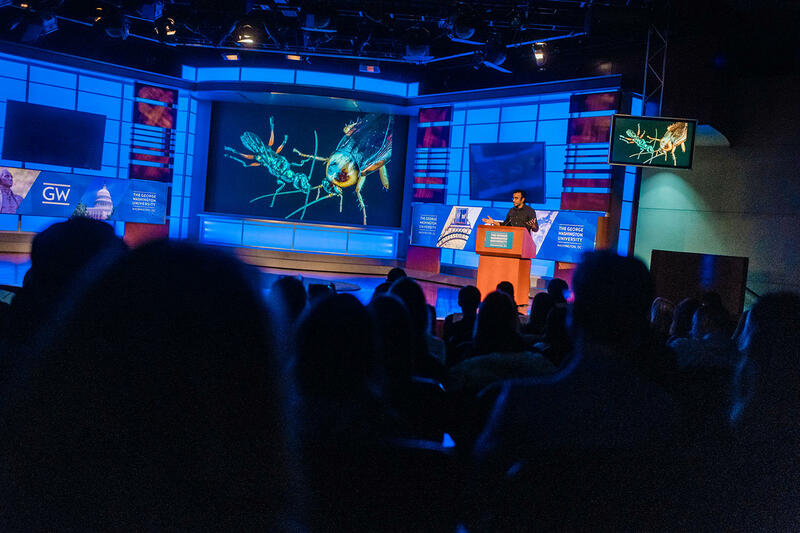 The 2019 Planet Forward Summit will take place at The George Washington University and begin Thursday in the Jack Morton Auditorium, move across the street for lunch and breakouts. Friday the event will return to Jack Morton Auditorium for more from the stage and our 2019 Storyfest Awards presentation.